It's not that long ago that having a 0.3MP camera on a phone was cutting edge. Now, 8MP is the industry standard on premium phones like the Apple iPhone 5 or Nokia Lumia 925. Even so, it's not enough. The Sony Xperia Z and Samsung Galaxy S4 include a 13MP sensor while Taiwanese manufacturer HTC has gone the other way, installing a camera sensor on the HTC One that only has 4MP, but is bigger than rivals and has bigger pixels, which aim to be more accurate and better at drawing in light. But no phone on the market at the moment has the optical zoom that sets compact cameras apart from cameraphones. Until the Samsung Galaxy S4 Zoom. Digital zooms, which is what every other current cameraphone offers, is simply a way of cropping an image: zoom in and the phone selects the central area of the image, but the pixel count of that smaller area remains constant so when you enlarge it, it quickly becomes blocky and pixelated. If you have enough pixels (like the Nokia Lumia 1020 will offer), this doesn't matter. But ideally, you'd have an optical zoom, which delivers full sensor resolution because you've zoomed in using the lens, not the sensor. The benefits of an optical zoom are huge - but unfortunately to squeeze one in, the phone becomes a bit on the huge side, too. So the S4 Zoom is much thicker than pretty much any smartphone rivals, especially catwalk-thin models like the Huawei Ascend P6, for instance. This phone measures 125.5 x 63.5 x 15.4mm, which is more than twice as thick as some others. But before you write it off, note that the bulge is taken up with the zoom, of course, and the hand grip at one end. This means that although it's a chunkier phone than most others, it is the most ergonomically comfortable phone to use as a camera. By far. Thin, curved-edge rectangles can be slippy or awkward to hold just right. This one fits the hand securely and the shutter button falls under the index finger effortlessly. 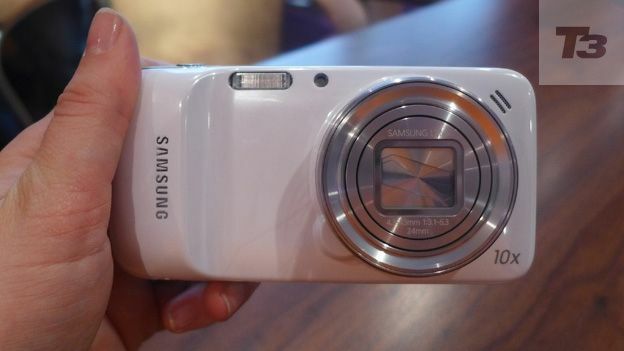 In style terms, the S4 Zoom closely resembles the Samsung Galaxy S4 Mini when seen from the screen side. It's only when you turn it round that the surprise of the camera element is revealed. From the other side it completely looks like a glossy plastic camera, even down to the white plastic circle on the bottom, which covers the tripod screw receiver. At the end with the hand grip is the micro USB connector and a flap that peels back to reveal the removable battery and the sim card slot. There's a microSD card slot as well, on the bottom edge along from the tripod socket. There's a home button on the phone screen face, and the only other buttons on the phone are on the top edge (when you're holding the phone as a camera, landscape-style) and are the usual power button and volume rocker. The S4 Zoom feels like the Samsung Galaxy Camera does: solidly built, glossy and just a little bit plasticky. As a camera it's a great size and shape. As a phone, the bulge it makes in the pocket is less noticeable than might be imagined, though holding it to your face as a phone is less comfortable than a slimmer phone. In phone terms, this cameraphone is very similar to the S4 Mini. Although it lacks some of the extras that the full-sized S4 has, this phone has S Translator, the very handy app where you speak in one language and the phone translates what you say and speaks it back to you (or the person you're trying to talk to) in another lingo. Since you may want to take your camera abroad on holiday, this is a very hand addition - though do remember that the app uses a data connection so watch out for roaming costs. Other Samsung specialities include Smart stay to turn the screen off when you're not looking at it and Smart Hub, which keeps games, videos music and books in one place. The phone's 4.3-inch screen is unexceptional in phone terms - though enormous for a compact camera. The screen is no match for the Samsung Galaxy S4's super high-resolution display, but it's still colourful, contrasty, bright and detailed. It's a 256 pixels per inch screen, so a lot lower than the pixel density of the iPhone 5 or HTC One. It's not bad at all, though premium smartphones have spoilt us for high-resolution displays. Okay, this is the main event on this phone. Let's begin with how it starts: pressing the shutter button does not wake the phone from standby, as it would on a Windows Phone 8 handset. Instead, you need to press the power button and from the lock screen swipe up from the camera icon. You need to set it up so that the camera icon appears on the lock screen. Once the phone is awake, though, you can shortcut to the camera by twisting the lens ring or long-pressing the shutter trigger. All this is good, but it's disappointing that you can't get to the camera faster. It takes time and you could miss that shot. The sensor is bigger than on other camera phones, though no match for a compact system camera, say. But it has 16MP resolution, which is pretty sparky for a phone. And there's that bulky zoom lens. It works as it would on a high-end camera by you twisting the lens. This is good, though in practice it's a bit slow so you may prefer the + and - icons on the touchscreen. It's good to have both options, mind. But having a 10x optical zoom is brilliant and highly impressive. Suddenly you're not limited to digital zoom and the awful blockiness that results from even the smallest zoom-in. The software is similar to the Samsung Galaxy Camera, including an Expert mode with a pleasing animation of a lens barrel to help you tweak the settings. Easier is the Smart mode, which has special settings for fireworks, sunset, night shots and many more. Smart mode suggest is especially useful, allowing you to choose between the three most suitable settings before you shoot. Of course, there's an auto setting, too. There are more ways to change images and swap between front and back cameras. Overall, this is a simple, intuitive camera to use with lots more features and subtleties than most phones can offer. It shoots video, too, though the motor noise on zooming is noticeable, which isn't ideal. Results from stills and video are strong and detailed. And there's the added advantage of being able to upload images instantly by wi-fi or over the mobile network, which is handy. There's some occasional shutter lag, images are over-exposed now and again but as a camera this is head and shoulders above much of the competition and stands out as matching the performance of many a compact. The processor is a dual-core model and works well, though if you're used to the stellar speeds of the S4 or HTC One, you may notice a slower pace here. It's nothing too serious, though. Multiple apps active at once could slow things a little, but this is a reasonably paced smartphone. The call quality and signal strength were not issues, both working well to make sure that calls sounded good and didn't drop. Battery life is similarly decent, and this phone has a removable battery. If you're planning a lot of photography, you might do well to pack an extra cell. For regular phone use, though, things sailed along happily for pretty much a whole day without issue. The real thing about this phone is the size that the zoom lens attaches to an otherwise slim smartphone. It's chunky. But if you are planning to take a lot of photographs, it's worth it. Although it's a bit of a gimmick and you shouldn't expect every manufacturer to ditch its super-thin models for beefy machines like this, the photographic results are excellent and the camera is much more versatile and efficient than on other phones. But you do need to have photography as a significant focus to make this more valid than a regular smartphone. If it's not, the extra size and weight, though still fitting the pocket reasonably well, may leave you resenting how much bigger it is than all your friends' phones.